The goal was to reach Vienna, just like many great leaders throughout history. My reasons may have been slightly different, however. And instead of challenging those that stood in my way, I would be relying completely on the help of strangers. Equipped with my pack and cardboard sign, I left my hostel in Bled and started walking towards the local bus station. Bled is a small town on the famous Slovenian lake that shares its name, and similar to many towns in Slovenia, there is only one major road going out. This would be my best shot to hitch a ride, as the motorway to Austria was several kilometers away. So, a little more confident and better prepared than my previous hitchhiking endeavor, I situated myself on this main road just past the bus station and displayed my carefully drawn sign, in hopes that one of the many German vacationers in the area would drop me off in Austria on their way home. To be honest, I wasn’t expecting to cover all 400 kilometers to Vienna in one day. Due to my location in the Northwestern part of Slovenia, I would have to switch motorways at least twice. The most ideal route would be to get a ride to the first major city across the border, Villach. From there, I could switch directions and head East to Graz, the last layover before Vienna. Starting at 10.30 in the morning, I assumed I would have a respectable amount of daylight hours to at least make it to Graz, accounting for the distance and uncertainty of wait time. Within seconds of facing the oncoming traffic, I was rushing over to my first ride of the day. Through the driver’s window, a local woman peeked her head out and urged me to get in, convinced that this was not a good spot to wait. Figuring her knowledge of the area was better than mine, I hopped in. Over the classic 90’s American rock music jamming from the speakers, Valentina vibrantly explained to me with the few words of English she knew that her husband used to hitchhike, and my best shot would be the petrol station by the motorway. Ten minutes later, I waved goodbye as Valentina drove off, leaving me at said station. The late morning heat was just kicking in, so I took off my pack and observed my potential rides. Most of the cars had Slovenian license plates, and after speaking with a few of the drivers, it seemed they were all local. Trying my luck with the truckers next, I met only one going to Austria, but he already had a travel companion with no room for a third. Having wasted enough time, I took my sign and walked to the only entrance to the station. Situated on a street parallel to the motorway with a roundabout on one end and the motorway entrance on the other, this spot seemed ideal. 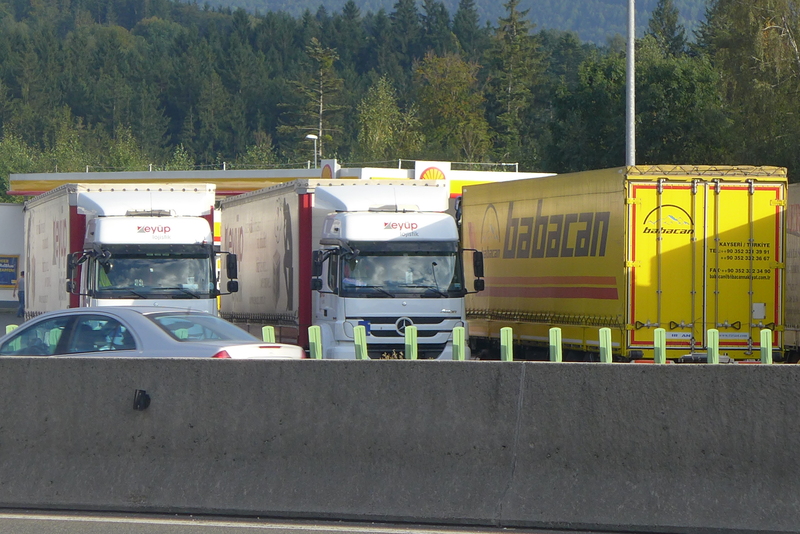 Logically, half of the traffic entering the motorway should have been northbound, and the Austrian border wasn’t too far away. But over the next hour, every car that had passed had been local, returning my eager smiles with a shake of the head or a shrug of the shoulders. Although long, the wait was actually entertaining, as most cars that drove by gave animated waves, smiles and gestures of endearment. But after another ten minutes, I took a break to refill my water bottle, contemplating whether to hop on a train at the nearby station. Deciding it was too early to give up, I went straight back, and within one minute, a small car came to a halt in front of me. Although the driver was local, I decided to get in, taking anything I could get at that point. Vladimir, a fellow in his early thirties, explained to me that this station wasn’t a good spot to wait…I was not happy with this trend, wondering if I would ever find this “good” spot. But Vladimir reassured me that, from his many years of hitchhiking experience, the location he was taking me would be no problem. What did I have to lose? After about a dozen kilometers of driving, during which Vlad explained all of the best hiking in the surrounding mountain ranges, we stopped on a dirt road on the outskirts of the next town over, Jesenice. This was the closest major town to the border. Vladimir told me to walk up the hill on the side of the road, where I would find an opening in a fence that would get me into a petrol station. The only entrance to this station was from the northbound side of the motorway, and it was the last stop before the border. In other words, every car there would have to enter the 6 kilometer tunnel into Austria. I liked these odds much better, and after thanking Vladimir, climbed up the slope to the station. Almost every car I saw had German plates, and there were many cars. This was a good sign. What was not such a good sign was that every car was filled with a complete set of blond heads, trunks full to the brim with luggage, dogs, and tons of things they probably didn’t use. I was pretty sure most wouldn’t respond too fondly to the idea of squeezing me in somewhere, so I began my hunt for the lone drivers. It took about half an hour of immediate rejections until I found someone who entertained a conversation for more than ten seconds. Smoking a cigarette near a collection of picnic benches was a middle aged man with a bluetooth headset and a stern look, the kind that screamed “don’t bother me.” So, I decided to bother him. Me – Hello, are you by chance going to Austria? Me – Austria? Villach? Vienna? SG – Sprechen Sie Deutsch? Me – Hmmm..Are you going to Austria? Me – So you will pass Villach…(show map of motorway)..Villach? Me – Can I get a ride to Villach? That answer came out of nowhere…and for a second I wondered whether this man understood what he had agreed to. Deciding not to complicate the matter any further, I followed SG (unfortunately, I can’t remember his actual name) to a brand new Mercedes and hopped in. Soon, we were heading full speed through the tunnel. During the drive, I learned that SG was actually Bosnian, and after fleeing with his family to Stuttgart during the war, he moved to Croatia and had been living there for 15 years. With the dozen or so Serbo-Croatian words I picked up over the previous six weeks and SG’s Bosnian, German and limited English, we managed to have a pretty good conversation during the ride (mostly about food, our common tongue). Maybe we had too engaging a conversation, because about half an hour into the trip, we missed the exit to Villach. Not to worry, there was one more exit which I pointed out, and nodding in understanding, SG proceeded to miss that exit as well.. Ten minutes later, I found myself at a rest station on the side of a mountain far away from Villach, with 70% of the traffic going to Germany and the rest going to Italy. I saw two hitchhikers near the exit with a huge sign reading “WIEN,” so I strolled over for a chat, only to find out they had been waiting for ninety minutes with no luck. It looked like I wouldn’t be making it to Vienna any time soon. Wandering around the station, I made a few observations: the only way out was by car, as the mountainside was too steep to descend on foot; there was a restaurant and store at the end of the rest area, a promising area to interact with drivers; and, yet again, most of the cars had German plates. 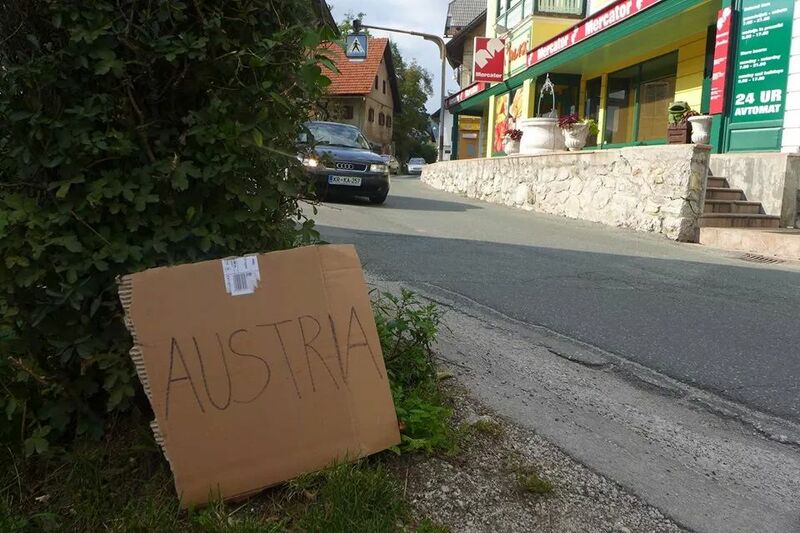 With no more use for my “AUSTRIA” sign, I recycled the cardboard and began talking to everyone. I wasn’t too keen on ending up in Germany, as that would be too large a detour for my Balkan travels, but I was open to any destination in Austria at that point. After my first fruitless attempts to hitch a ride, I took a break to chat with a Turkish truck driver who had been stuck at the petrol station for three days. 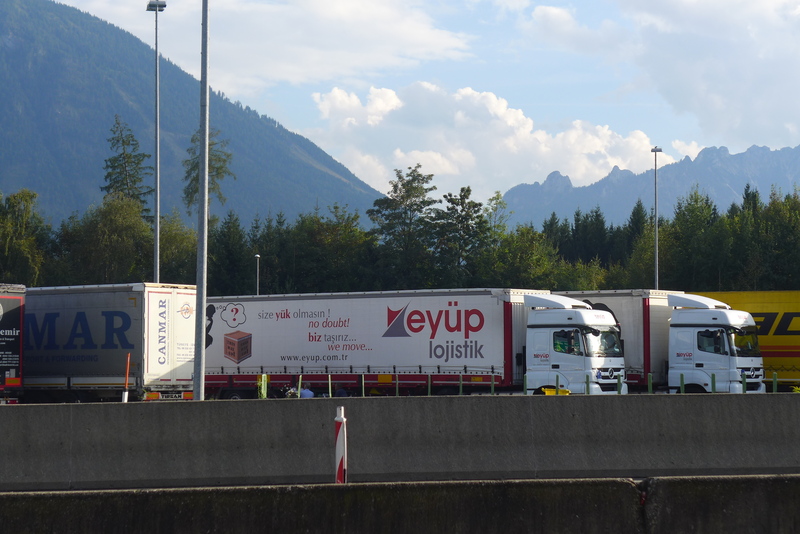 His company had intentionally disregarded certain paperwork required for driving through Austria, assuming he wouldn’t get caught in the short drive through. However, upon getting randomly pulled over and fined, Mehmet had no choice but to wait for the local police to arrive. It was a nice change of pace for the both of us, as we exchanged stories for the next hour. Soon thereafter, I met two students from Luxembourg who were halfway through tackling a long drive back home from Croatia. After chatting for a bit, they agreed to drop me off in Salzburg, and following a quick lunch together, we began the scenic 172 kilometer drive through the countryside. 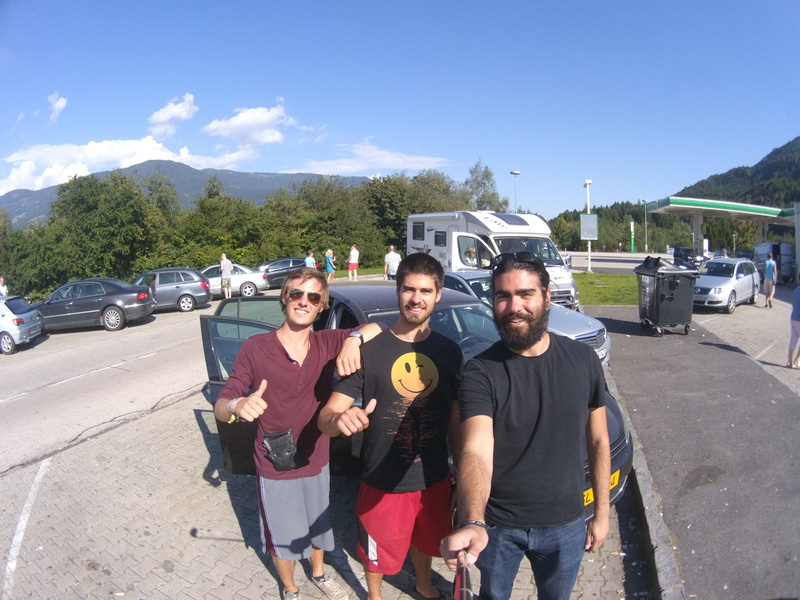 Yannick and Adrien made for great travel companions, sharing stories from their roadtrip and listening to mine. Further, having studied in Vienna, Yannick had many valuable recommendations regarding attractions and, more importantly, dining options for when I would eventually get there. Of course, it would be too easy if we actually made it to Salzburg. Keeping up with the daily trends, we missed the junction just South of the city and were suddenly heading West towards Munich. Alas, within a few minutes, I found myself yet again at a petrol station on the wrong side of the motorway, kilometers away from my destination. 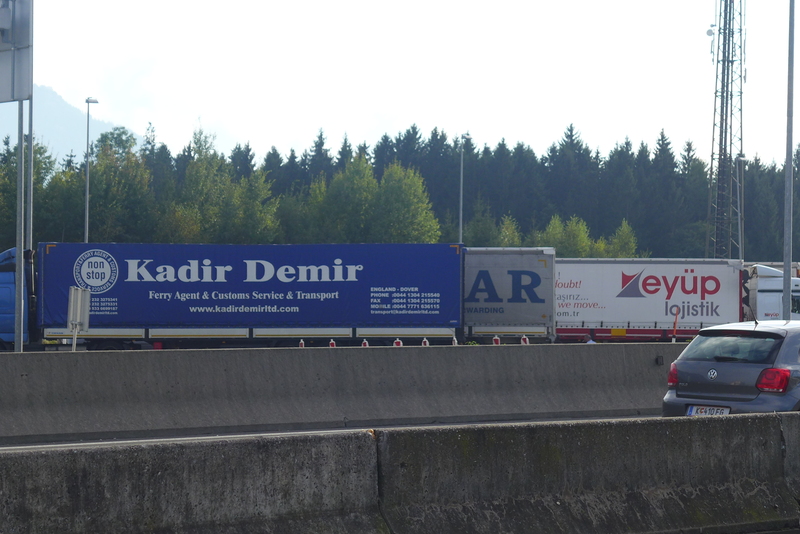 If only I could make it to the station on the other side, where I spotted dozens of Turkish trucks, of which at least one would surely give me a lift into town. Whether or not someone had stranded hitchhikers like myself in mind, an underpass had been constructed connecting the two stations. Relieved, I hurried to the other side and walked towards the trucks. But I never made it that far, because on the way, I met a Turkish couple who agreed to take me as far as the Salzburg airport. I agreed without hesitation and joined them in their tiny car. Over the course of the seven minute drive, Hakan, who was sitting in the driver’s seat, explained how he and Zeliha, who sat in the back, fled their homes in Turkey to be together, against the wishes of their traditional families, and were now staying illegally in Europe with hopeful smiles despite their quickly dwindling finances…what a day. Waving goodbye to my last ride, I asked for directions to the city center, and upon learning that it was a half hour walk, I decided to enjoy the last bits of daylight with a stroll. Thirty minutes later, I asked again for directions, only to be told that the center was another half hour walk away. Comically, this scenario repeated itself yet again, and 8 kilometers after I had begun walking, I finally reached the banks of the Salzach river. 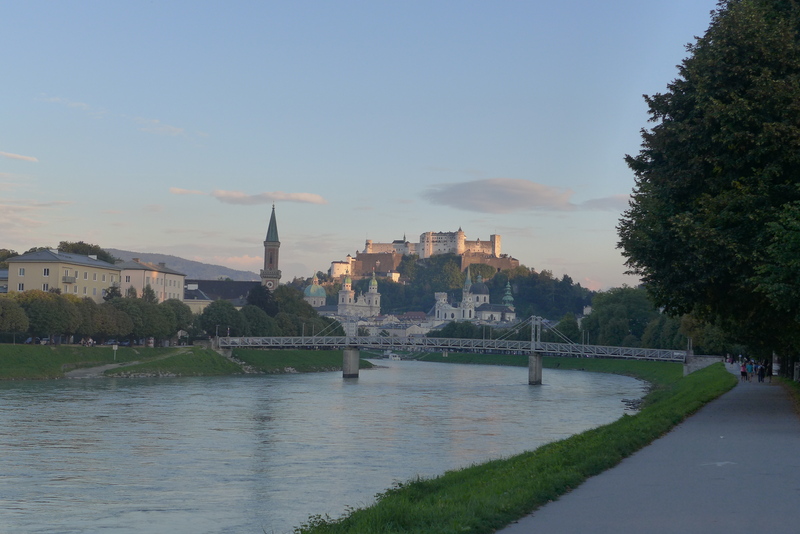 My eyes followed the gentle flow of the river to the sun setting over the old city of Salzburg in the distance. I had made it. Although it wasn’t Vienna, and I wasn’t there to capture the city, I felt like I had conquered something. Armed with my 35 liters and an army of strangers, I had traveled 250 kilometers, jumped in 5 different cars, walked over 10 kilometers, and tackled over 8 hours of heat, missed exits, and grumpy German families and stern guys alike…and my reward was one that the conquerors of Vienna could only dream about…a warm bed and 13 hour sleep. Probably my favorite post yet. Incredible day and trek.